• Super lightweight trimmer for quick and easy cutting. • Ideal for craft and photographic trimming. • Clear paper and photograph size template marking on the baseboard improve the accuracy of cut. • TÜV certified for safety and quality, the self-sharpening rotary blade is safely enclosed in its cutterhead. This Avery Photo and Paper Trimmer is super lightweight with a self-sharpening rotary blade. The blade is fully enclosed in the ergonomic cutter head for safety. The trimmer also features printed paper and photo size guides for accuracy. 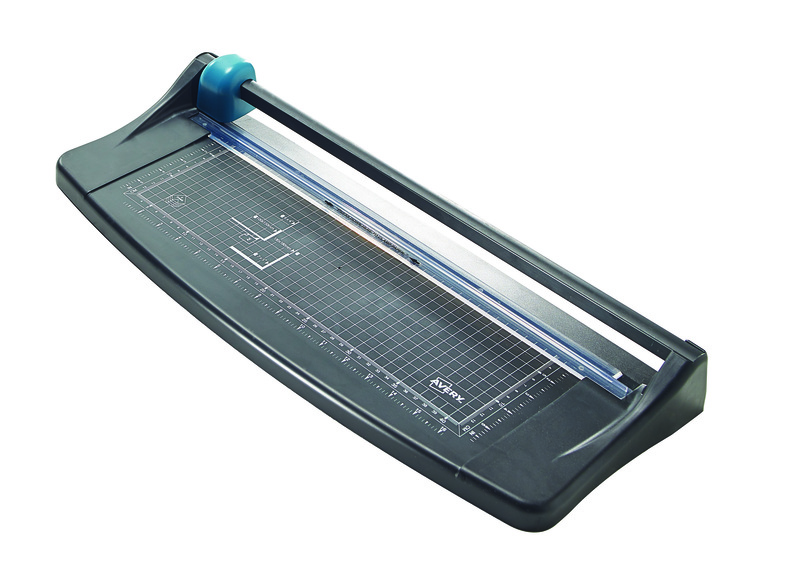 This A3 trimmer has a cutting length of 440mm and a capacity of up to 5 sheets of 80gsm paper.